North Carolina's 5.8% unemployment rate is the lowest it's been since 2008. The North Carolina legislature is back in session this week. The Republican-led body is touting a strong economy and an unemployment rate that hasn’t been this low since the start of the Great Recession. So, bust out the Moscato! The unemployment rate in North Carolina is 5.8 percent. Governor Pat McCrory says it hasn’t been that low since 2008. 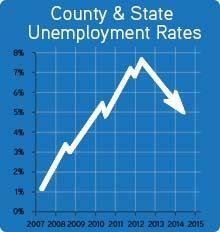 Leoneda Inge takes a closer look at the state's 5.8 percent unemployment rate. This was the only time the crowd of bankers and business-types applauded the governor during his speech at the annual 2015 Economic Forecast Forum. And it was a long speech. GOP legislative leaders say this positive economic movement is a result of tough policies, like cutting corporate and income taxes, and slashing the number of weeks the unemployed can receive benefits, along with the amount claimants can receive. Mark Vitner is a Senior Economist at Wells Fargo. He spoke after McCrory, joking, the governor’s long speech could be an economic indicator. “There’s probably some sort of economic relationship to how good the economy is and how long the governor talks, because if the economy was bad he would have been out of here, quick," said Vitner. Vitner says there is no question North Carolina’s economy is in a better place than it was two years ago. “2015 and 2016 are likely to be, along with 2014, which is close to it, the best years for the economy in this decade. We are in the sweet spot of the economic expansion,” said Vitner. Vitner goes on to say North Carolina has recovered all the jobs it lost during the recession, and is poised to create 110,000 jobs in 2015. The problem is many North Carolina workers are still hurting. Bill Rowe is the Director of Advocacy for the North Carolina Justice Center. “And I think that we still have a significant deficit out there where the number of people who want to work and the number of jobs that are there are not matching up," said Rowe. A report released by the state Commerce Department tries to explain why the long-term unemployed are still unemployed. Employers could presume they are not good candidates, or there is a skills mismatch. Alicia McDonald and several other people are waiting at a bus stop outside the Joblink Career Center in Durham. McDonald works part-time in Raleigh and says she really needs another part-time job or a full-time job with benefits. “I was optimistic because it was a New Year and I like to come in the New Year optimistic," said McDonald. McDonald says she noticed on the computer at the career center that many companies had a few openings. But she’s not as optimistic anymore about securing one of those jobs. Still, McDonald feels fortunate to have the hours she has, compared with her co-workers. “They go and they work two hours here, an hour there, two hours there like that to make ends meet in minimum wage," said McDonald. "That’s a lot of moving around with your car and on the bus, gas being spent out, but you have to try to make the money. The struggle continues for McDonald and many like her. >>Look at a preview of the legislative year ahead as it pertains to the environment. The state Commerce Department is behind a major jump in the number of weekly job searches claimants must have to collect benefits. Dale Folwell is Assistant Commerce Secretary for Employment Security and he supports increasing weekly documented job searches from two to five. “So we think this will increase the velocity of people getting off the unemployment rolls and looking for work," said Folwell. Folwell says the current system was confusing for some people. He says his office decided to cut the confusion and add searches at the same time. Business, banking and community leaders packed the Sheraton Imperial Hotel Monday in Research Triangle Park for this year’s annual Economic Forecast Forum. It's sponsored by the North Carolina Bankers Association and the North Carolina Chamber of Commerce. Economic experts seem to be on the same page when it comes to forecasting the state’s economy in 2015. Expectations are high.